A month ago I found myself in Bloomington Normal for the One State Together in the Arts, the only conference for Illinois' entire creative community. While I was down there I met a number of people, one of which was Ife Williams who told me about her project “See Me Better”. Bringing together ten Community Organizations to create murals on boards that will be secured over windows of vacant properties in North Lawndale, south Lawndale and East Garfield. Since late January, students and community members have been meeting weekly, brainstorming ideas for their mural concepts and designs, developing fundamentals in art, as well as participating in neighborhood field trips and history lessons. Classes were led by art students from a number of colleges around Chicago. 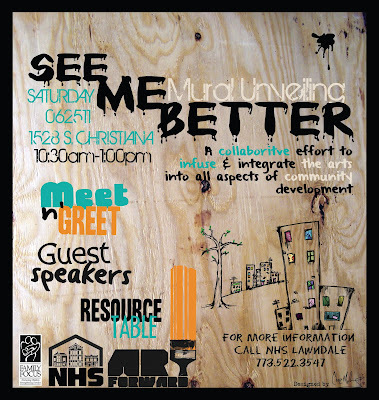 This Saturday June 25th the public will get their first look at the results of this project, from 10am -1:30pm at 1528 S Christina you will have the opportunity to meet the artists and talk with the organizations involved in the project, as well as partake in a community barbeque lunch.